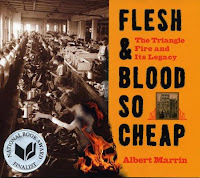 Flesh & Blood So Cheap by Albert Marrin. Grades 7 and up. Random House Children's Books, February 2011. 182 pages. Review copy provided by my local library. On Saturday, March 25, 1911, just at the end of the workday, the Triangle Shirtwaist Factory in New York City caught fire. The doors were locked to discourage factory workers from leaving early. The fire hoses were not connected. Flames soon exploded out of control as the highly flammable cloth scraps and paper patterns caught fire. The factory occupied the top three floors of a 10-story building. Many women had no choice but jump or be burned to death. 146 people, mostly women, died in the Triangle Fire, and this well-researched book is more than a chronicle of the worst workplace disaster New York has ever seen (with the exception of the 9/11 terrorist attacks). It's a snapshot of the time and a portrait of a changing nation. The first half of the book examines immigration in America in the second half of the 19th century and how it shaped the way American industry developed. It paints just the right mood for acknowledging how terribly tragic the Triangle Fire was. The last part of the book shows what changes were made in industry and labor laws as a result of the fire and shows that sweatshops still exist in many parts of the world. Archival photos are well-selected and well-used to bring the time period to life. Back matter includes a bibliography, source notes, and an index. The writing is accessible and interesting, giving teens a glimpse into the lives of teens and children of this era. Not only would this make a great addition to history lessons, but it could easily spark conversations about immigration and how it has changed in this country over the past hundred years. This book would make a perfect pairing with Uprising by Margaret Peterson Haddix or Katherine Paterson's Bread and Roses, Too or Lyddie. For older teens interested in a more recent look at immigration and sweatshop work, you could also pair this book with Girl in Translation by Jean Kwok. And, of course, don't forget Russell Freedman's Kids at Work: Lewis Hine and the Crusade Against Child Labor. You can find more reviews of Flesh & Blood So Cheap at Biblio File and The Fourth Musketeer. 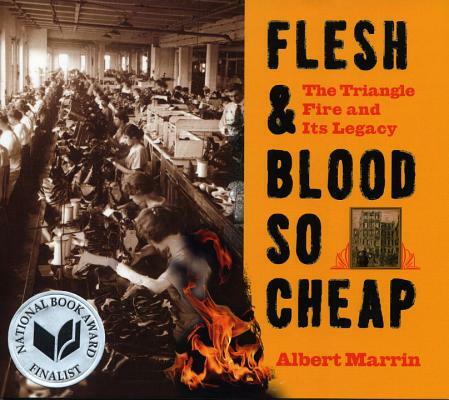 Flesh & Blood So Cheap, finalist for the 2011 National Book Award, is on shelves now! Happy Nonfiction Monday! Check out this week's roundup at Great Kid Books.